Finely dice the red bell pepper and place in a large mixing bowl. Chop scallions and add to the mixing bowl. Add chives and parsley, and mix. Add Worcestershire, mustard, and mayonnaise, and stir to combine. Add salt, crab meat, and Panko crumbs, and mix. Use a one-quarter cup measuring cup to portion the mixture into 12 crab cakes. 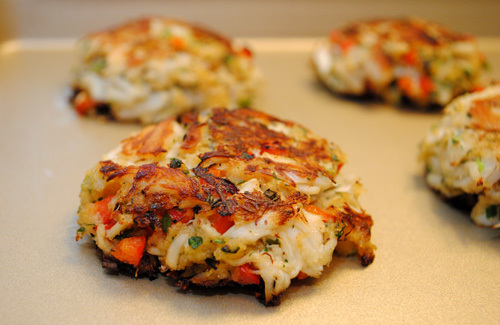 To ensure crab cakes stay together, press each portion firmly into a disc shape. Place formed cakes on a plate and chill in the refrigerator for at least an hour. Preheat oven to 350 degrees-F. Heat 1 Tbsp. oil in a large skillet over medium heat. Add 6 chilled crab cakes and cook for 2 minutes, turn, and cook for an additional 2 minutes. Transfer to a cookie sheet and bake for 6 minutes. While the first batch of crab cakes bake, repeat cooking steps with the remaining crab cakes. Serve crab cakes warm with dipping sauce, either Tartar Sauce or Herbed Sour Cream Sauce.